Don Tudor | Galion Inquirer Galion’s Dominic Pittman came up big for the Tigers on Friday night against visiting Harding. Pittman converted all four of his extra-point attempts and hit a 25-yard field goal in the second quarter as the blue and orange picked up their first MOAC victory of the season; 31-28. GALION — Week six of high school football action saw the Galion Tigers hosting the Harding Presidents in a Mid-Ohio Athletic Conference clash at Unckrich Stadium in Heise Park. Both teams entered the contest in search of their first conference victory of the 2018 season. Galion would see a strong push by Harding towards the end of the game but would hold on for the hard fought victory; 31-28. With the victory, the Tigers improve their season record to 4-2 while moving to 1-2 within the MOAC. For the Presidents, they drop to 1-5 with the loss and are currently 0-3 in the league. Galion will head to Bellville for a meeting with the Clear Fork Colts in week seven. Clear Fork marched to a 6-0 (3-0) record by downing River Valley (2-4, 1-2) in a lopsided affair; 48-6. Harding will be on the road again, this time heading to Richwood for a matchup against the North Union Wildcats. The ‘Cats (4-2, 1-2) were defeated by Pleasant (6-0, 3-0) in week six action; 35-13. It would be the home team striking first on Friday as Colbey Fox pushed his way through the line for a two-yard touchdown less than four minutes into the game. Dominic Pittman booted the extra-point attempt through the uprights and the Tigers had the early, 7-0 advantage. Five minutes later though, the Presidents and Devin Mallory would find the endzone on a three-yard scamper and added the PAT to knot the game at seven points apiece. Just three seconds into the second quarter, Pittman put Galion back on top with a 25-yard field goal. Eight minutes would go by before Harding would answer but would do so by taking their first lead of the game thanks to another rushing touchdown by Mallory. Trailing 10-7, the Tigers looked to take the lead into the half, moving the ball down the field and running down the clock. Quarterback Elias Middleton would find wideout Isaiah Alsip for a 38-yard touchdown and with another Pittman extra-point, the blue and orange took the slim, 17-14 lead into the locker room. As with the first two quarters, the home squad would strike first in the third thanks to a QB keeper by Middleton, crossing the goal line from 10-yards out. Pittman would make the score 24-14 with the successful PAT. The Presidents would not stand idly by though and less than three minutes later saw Andrew Brazell connect with Noah Thompson for the 26-yard aerial strike. After the extra-point went through the uprights, Galion saw Harding cut their lead to 24-21 heading into the fourth quarter. In that final frame, Middleton would dash into the endzone from 10-yards out again while Pittman put the blue and orange up 31-21. But again, the Presidents would answer and in a big way. Mallory broke multiple tackles en route to picking up his third score of the night from 62 yards out. Brazell’s extra-point brought the score to 31-28. Throughout the remainder of the quarter, both teams would see their offenses and defenses struggle, including multiple incompletions and interceptions, as well as the failure to convert necessary third and fourth down plays. In the closing moments of the game, the Presidents, down just the three points drove the ball deep into Galion territory. With the Presidents knocking, the Tigers’ defense answer, causing the Harding “O” to settle for a field-goal attempt. 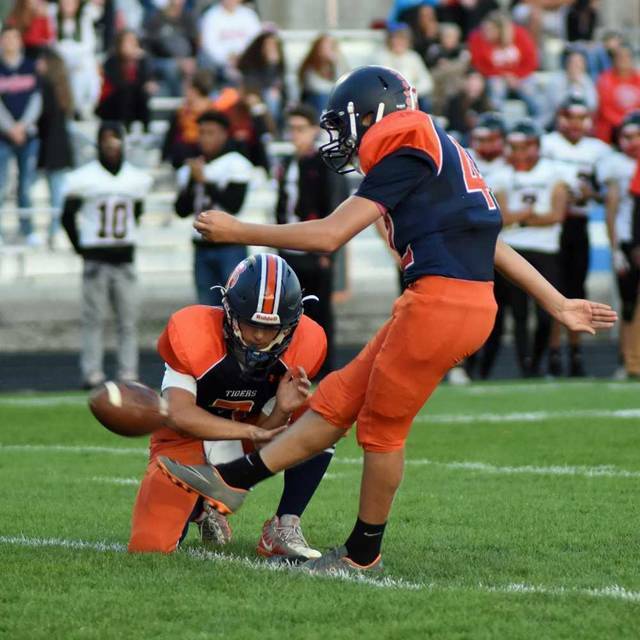 After “icing” the kicker with a timeout, Galion’s plan appeared to work as the kick missed right and the home team picked up the victory. Harding offensive statistics from Friday were: Brazell- 7/11 passing, 186 yards, TD; Thompson- 7 catches, 186 yards, TD; Mallory- 43 carries, 174 yards, 3 TD and Team- 344 yards (186 passing, 158 rushing) total offense, 14 first downs, 0 TO and 25:19 time of possession. The Presidents were flagged just once, resulting in 15 yards. Middleton wrapped Friday’s action at 8/15 passing for 113 yards, one TD and two interceptions. Middleton also carried the ball 28 times for 166 yards and two scores. On the ground, Fox carried the ball 13 times, resulting in 54 yards and a touchdown. Trevor O’Brien picked up 30 yards on just six carries while Alsip got three attempts for 14 yards. Alsip also finished the night with four catches, including the touchdown, for 74 yards. Gage Lackey caught one pass for 22 yards while Kalib Griffin snagged three passes for 17 yards. Galion racked up 27 first downs thanks to 376 yards (113 passing, 263 rushing) throughout the game Friday while having the ball in their possession for 22:41. The Tigers had two turnovers against the Presidents defense and were flagged three times for 25 yards. https://www.galioninquirer.com/wp-content/uploads/sites/38/2018/10/web1_Dominic-Pittman.jpgDon Tudor | Galion Inquirer Galion’s Dominic Pittman came up big for the Tigers on Friday night against visiting Harding. Pittman converted all four of his extra-point attempts and hit a 25-yard field goal in the second quarter as the blue and orange picked up their first MOAC victory of the season; 31-28.